Very reliable company, posted 5pm money was in my account next day by 2pm. They also called and informed me they received the funds. Good rates too online, would of got alot less if I went to Sainsbury's, post office etc. Sold travel money back to Ruislip Posted back Monday. Money in my bank the next day Brilliant Service. Well Done. Went to the Pinner branch where they were kind enough to stay open 20 extra minutes to accommodate me as I arrived late in the day. The service was prompt, the staff friendly and the rates were the best I’d seen around. Excellent fast service. Good communications and fast payment to my account. Would have no hesitation in recommending them. Posted 8300 Thai Baht Wednesday - received email Friday to confirm my bank account had been credited £192 .13 Best Exchange Rate on line !!!!! Selling currency was very easy. Having over £100 of Czech koruna left from a recent trip I was able to post it to Ruislip and exchange made within 2 days. 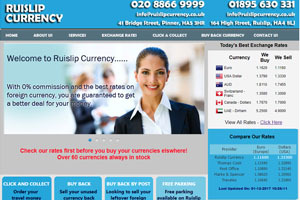 You do need to send by special delivery to be sure of a signed for, secure delivery, so Ruislip provide excellent exchange rates when the cash quantity is significant. I just changed 720,000 HUF (about 2000 GBP) with them. The rate was excellent and the GBP was transferred within hours of receiving it. Most companies take at least 3 working days to credit your account so this was exceptional. Excellent service. Best rate provided to sell my Hungarian Florints. Had to pay £6.50 for special delivery of currency to them , but still worked out a good deal . Currency was posted back to them on a Friday .They rang me to say they had received currency on a Saturday and that the money would be in my bank on Monday ----And it was. Brilliant . Fast service From filling in the online form to money in bank less than 24hrs I wii certainly use them again,and have no problem recommending them to my friends Well worth 5???? I posted my Hungarian Forint to change back to £ on the 12.6.18 at 1pm and have just received an email to confirm they have received them and deposited funds into my account all by 4PM the next working day! It was such a great rate too, would definitely recommend. Filled in the form online, printed it out, posted via special delivery with money. Money in Bank next day. Excellent service and would definitely use again. Could not believe how easy it was to use. Got a call at about 2pm to say the money had arrived, everything was correct and the money would be in my bank by close of play tomorrow. Got an email at 5pm to say money had been transfered. Excellent service. Fabulous service, posted money of on Monday 21sy May and cash in my account by 1.30PM the following day!! Well impressed.